Comics – Faith, Hope and Cheryl! One day (presumably Friday) at Pembrooke Academy, at the end of the school day, Cheryl and Jason are leaving their Sociology class, but their teacher, Mr. Goodfellow, wants to see them. Jason’s supposed to meet the guys at the yacht club, and Cheryl wants to go, too, to hang with Jason’s “good-looking” friends. He offers them extra credit. Jason’s grades could use a boost, so he agrees. Not to be outshone, Cheryl agrees as well. Mr. Goodfellow tells them to do volunteer work of their choice and report back to him at the end of the month. The one that does the most work gets the most bonus grade points. Jason and Cheryl exchange some trash talk. This is all a social experiment being conducted by Mr. Goodfellow: making “the most selfish, snobbish students at Pembrooke” do volunteer work; he just hopes he hasn’t unleashed anything too terrible on the world. *Jason suggests something “frivolous” to be painted on Archie’s car instead of something “gay-frivolous”. *Jason calls Elmo the Spray Doctor an “artist” instead of an “artiste”. I don’t know which possibility is worse: a misguided “correction” or intentional dumbing down. *Part of Cheryl’s dialogue (“we’ll fool around–“) is removed, and her word balloon is made smaller. *The “HAH” at the right side of the final panel is recolored from yellow to red, possibly to contrast better against the yellow bijou building. On Saturday morning, Cheryl speeds in her pink sports car (almost running over a cat and an old lady) to meet her little sibling in a ghetto area. She has a head start on Jason, since she’d stopped at the organization yesterday afternoon. At the house, Cheryl shakes hands with and introduces herself to a girl named Kay. She decides the house is depressing and pretty much kidnaps Kay, to her mother’s surprise. Before I move on, I gotta note the cute vanity plate on the front of Cheryl’s car: 2RCH4U. As she drives, Cheryl decides to call Kay Constance (since Kay is “so common”). At a stoplight, Jason meets up with her. He has two little brothers, due to registering with several agencies. Jason drives off, honking his horn. Deciding this is war, Cheryl has “Constance” give her a list of all of her friends. Jason and his “brothers” are just leaving the billiards hall (the kids apparently didn’t do too well). Cheryl shows up with six girls crammed into her sports car (which I’m pretty sure is illegal), mentions taking them for mani-pedis, and then takes off. Jason decides to round up more kids before the big street hockey game. At the salon, a girl asks Cheryl for ice cream. Cheryl agrees if they can work it in between the aerobics class and their massage appointments. As the weeks go by, Jason teaches his boys to throw rotten fruit at carnival performers and hit on waitresses with lame pick-up lines. Cheryl takes her girls out for sushi (which possibly makes one of them sick), to yoga class, and to the hair salon (overdoing it with the hair). Cheryl and Jason have dressed their kids like themselves. The girls run into the boys on the street, and Cheryl instructs them to ignore their lame pick-up lines. Jason and Cheryl decide to call it even for the rest of the month, but then Cheryl realizes their kids have disappeared. The kids find Mr. Goodfellow’s house and complain to him. The girls are worried about Cheryl’s potential plans to take them helicopter skiing in Aspen, and the boys are worried about Jason’s definitive plans of a cliff-diving trip to Acapulco. Mr. Goodfellow decides to see if Cheryl’s Riverdale friends will take on the kids. The next day, Mr. Goodfellow has Jason and Cheryl stay after class and come with him. Soon, they arrive in an area of Riverdale and see the kids playing baseball with Archie and Betty. 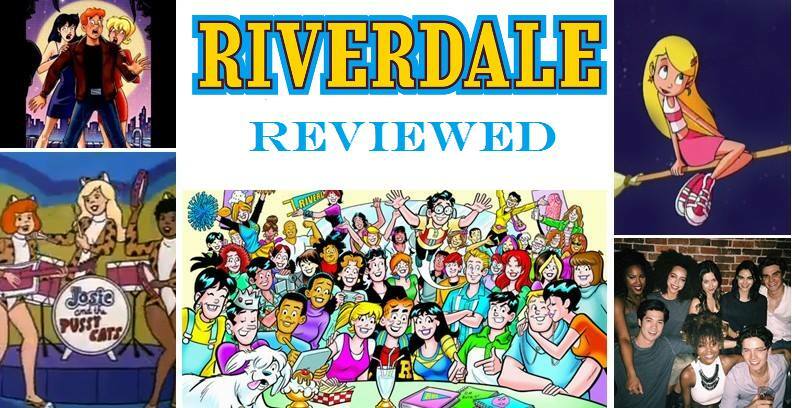 Cheryl plans to yell at the kids for seeing other “big siblings” behind their backs, but Mr. Goodfellow points out that they’re happy, carefree, and having a good time (although, I have to point out, one of the girls is wearing a cap with Archie’s face on it). Cheryl takes this to mean he’s saying they weren’t doing a good job. He says maybe they just aren’t suited to working with children and suggests the elderly. Cheryl thinks that’s a great idea. Jason says at least they won’t have to use fake I.D.s (what the hell was he having his boys do?). Mr. Goodfellow tells them to give it their best shot. Cheryl thinks she’ll do well with old people, because she calls Grandma every Christmas. So, naturally, Cheryl takes two old women named Madge and Clara to a Squashing Tomatoes concert. Cheryl gave Madge pumps, but they’re murder on her bunions. Clara thought they were going to a Sinatra concert. This story is pretty fun. Sure, Cheryl and Jason went overboard and tried to mold the kids into younger versions of themselves, but, with the exception of the potential ski trip, I think Cheryl was generally a better big sibling than her brother.